Especially during the Christmas holiday, I find myself a little too busy to make cut out cookies. So I often leave them for special days like Valentine’s Day. 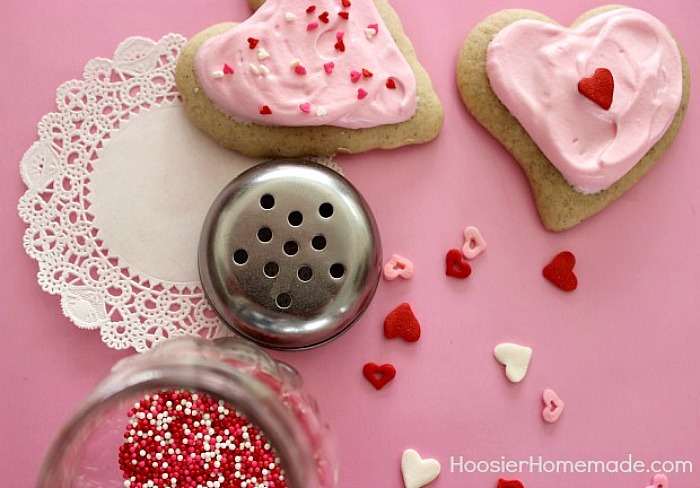 I have been using this recipe for Valentine Sugar Cookies for many years and my boys absolutely love it! I baked a half batch a couple days ago and had planned on sharing the recipe with you, and before I could even get them frosted, 40 cookies were gone within hours. So I whipped up another batch last night, and set out to bake and decorate them today. This time though, I made a full batch and had them all done and photographed before the boys got home from school. And it’s a good thing too, the minute they saw them they grabbed a plate and piled them on. While I absolutely love the look of sugar cookies decorated fancy with royal icing, I simply don’t have the time or patience to spend on them. 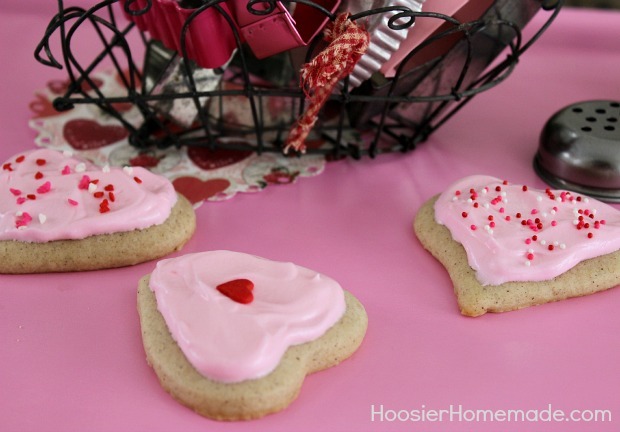 I have also tried many different sugar cookie recipes, and my boys just love these. Not only are they soft and a little thicker than a normal sugar cookie, they have a hint of cinnamon and nutmeg in them giving them a wonderful flavor. 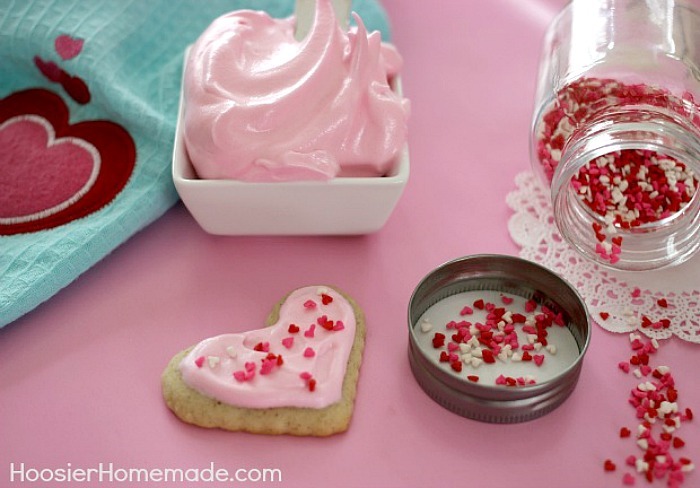 After falling in love with the Fluffy Marshmallow Frosting I used on the Conversation Heart Cupcakes earlier this week, I just had to make another batch for these Valentine Sugar Cookies. And the Micro Heart Sprinkles make me happy! 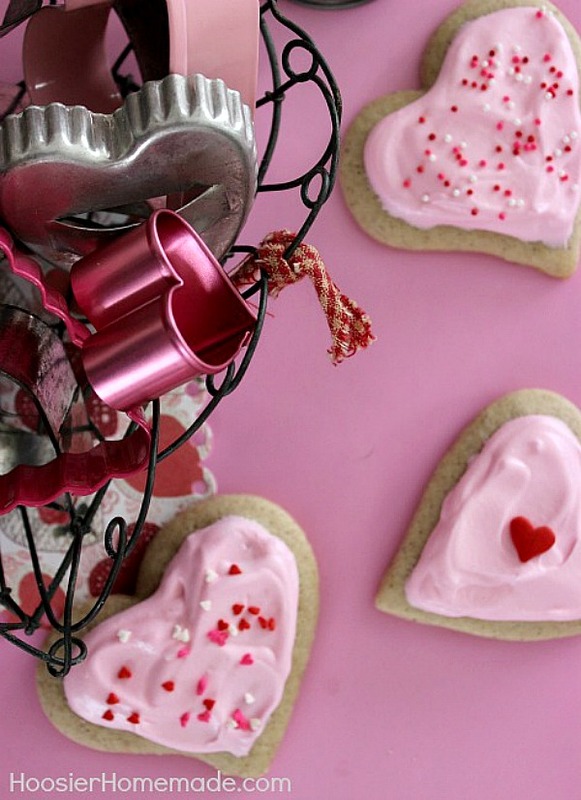 While I’m sure there are many, I think I have just about every heart shape cookie cutter around. 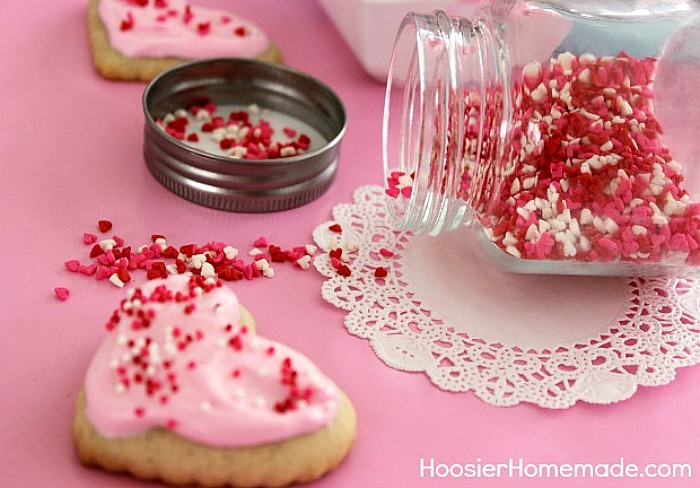 Besides the Micro Heart Sprinkles, the Valentine Nonpareils are another favorite of mine. Can you tell we had a little fun with the photo shoot? 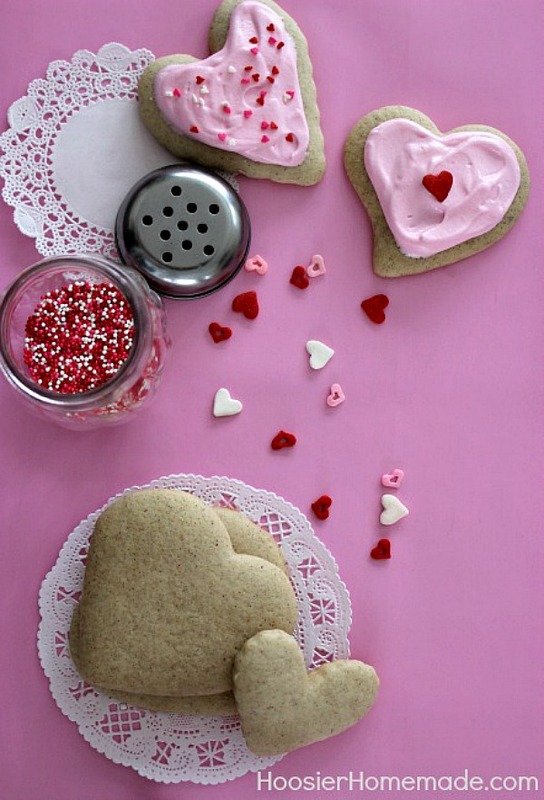 I just L-O-V-E Valentine’s Day! 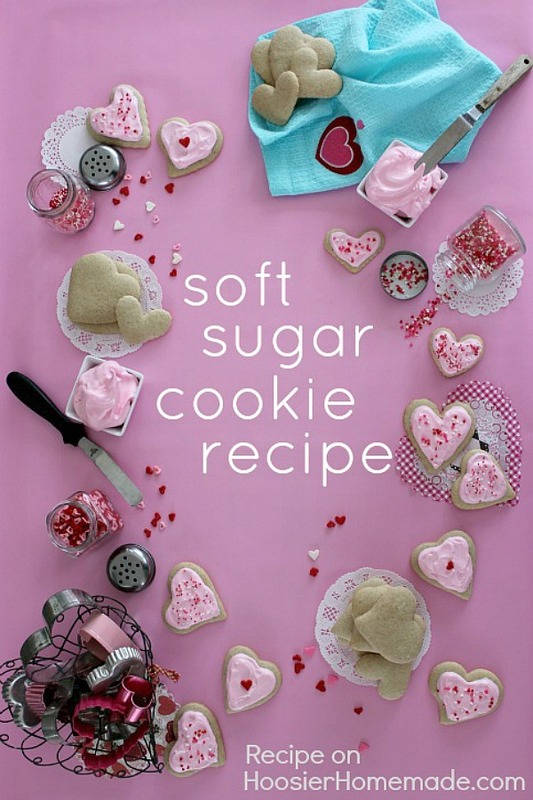 The BEST soft sugar cookie you will ever have. These look sooo yummy! Do you think you could substitute Greek yogurt for the sour cream? Hi Jackie, I have never substituted it but I think it would work fine. Let me know if you try it. Yes I agree, Bonnie, sorry about that, I suppose you don’t need to preheat that long. It’s just habit for me to type preheat in the #1 spot.